The Lakers, who are missing Kobe Bryant, Steve Nash, Jordan Farmar and Steve Blake with various injuries, lost for the ninth time in 10 games. 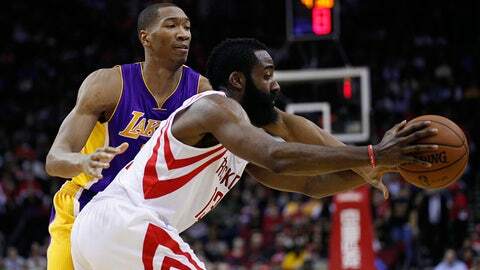 HOUSTON (AP) — James Harden tied a season high with 38 points and Dwight Howard added 20 points and 13 rebounds to propel the Houston Rockets to a 113-99 win over the Los Angeles Lakers on Wednesday night. Howard got his first win against his former team as the Rockets used a big third-quarter run to take the lead and send the injury-riddled Lakers to their third straight loss. The Rockets trailed by a basket in the third quarter before going on a 17-2 run to take an 80-67 lead and roll to win. Harden continued his recent torrid scoring with his third straight 30-point game. He has piled up 113 points in the last three games combined. Nick Young scored 25 points to lead Los Angeles and Pau Gasol and Jodie Meeks scored 21 each. Ronnie Brewer started for the first time this season in place of the injured Chandler Parsons, who was out with a sore right knee. Howard made a season-high four steals, Harden collected a season-best five steals, and Terrence Jones had 15 points and 13 rebounds. The Lakers had a two-point lead midway through the third quarter when Houston got rolling, scoring seven straight points thanks to a 3-pointer by Harden and back-to-back buckets by Howard to take a 70-65 lead. The second one brought the crowd to its feet when Harden swiped a bad pass from Kendall Marshall and tossed up an alley-oop that Howard finished with a monster two-handed slam. That spurt was the beginning of the 17-2 burst that extended Houston’s lead to 80-67 with about two minutes left in the quarter. Harden was on fire in that span, scoring nine points and drawing a collective "ooh" from the crowd when he crossed up rookie Ryan Kelly on a layup to cap it. Los Angeles was as cold as Harden was hot, missing five shots and committing three turnovers while the Rockets built the lead. He admitted after practice Tuesday that he was ticked off that Los Angeles came out on top in the first meeting earlier this season. The center missed several key free throws down the stretch in that one, a one-point win by the Lakers in November when they employed the Hack-A-Howard strategy. They were down by 14 points when they used that approach again Wednesday night, fouling him every time Houston got the ball for a two-minute span ending with about two minutes left. Howard made just six of 14, but Houston’s lead was so big this time it didn’t matter. He finished 10 of 24 from the free throw line. The Lakers, who are missing Kobe Bryant, Steve Nash, Jordan Farmar and Steve Blake with various injuries, lost for the ninth time in 10 games. Bryant watched the game from the end of the bench and shook his head often during bad plays by the Lakers. When Young had a silly foul on Harden in the fourth quarter the face of the franchise put his head in his hands and slumped his shoulders. Houston opened the second half with a 9-3 run to take a 61-60 lead with about 8 minutes left in the third quarter. Jones scored the last four points of that run. Wesley Johnson had a highlight-reel play near the end of the first quarter when he sailed over the head of Houston’s Aaron Brooks for a layup to put Los Angeles up 26-23. Los Angeles led by nine after a putback layup by Gasol about 2 minutes before halftime. Houston outscored the Lakers 10-6 after that to cut the lead to 57-52 at halftime. Harden scored five points during that span. NOTES: Houston C Omer Asik missed his 17th straight game right thigh and knee injuries. … Houston’s Greg Smith sat out with a sprained right knee. … New Houston Texans coach Bill O’Brien watched the game from a courtside seat.